Sorry for the length and amount of questions in advance!! I am a newbie and need as much help as I can get! And thank you in advance as well for anyone who takes the time to respond! I have some questions about setting up my irrigation system and was hoping some of you could help! 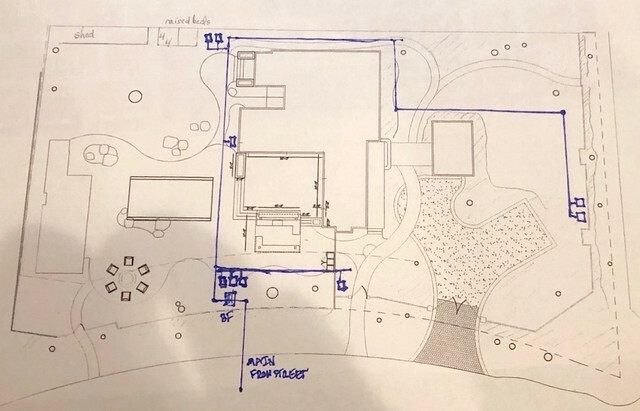 I don't have any lawn but I do have quite a few zones that will all be running drip irrigation. As of right now, all I have is a back flow device off of the main line from the street and a Flow Meter directly after that. Rachio sent me a Flow Meter and their 3rd generation Controller for free, to test and see if the flow meter can still connect to wifi if installed in a valve box underground, which I have installed and it does! So thats a good deal. So I don't need to worry about a flow meter or a controller, but the rest I need some help with. I have some time off, and I want to install the system myself so it has been a learning process. But I like doing this sort of thing, and I enjoy diving deep into a new topic and learning as much as I can. After the back flow I have a PSI of 70~75 and about 17 GPM with 1" pipe . I currently have 8 zones planned. I was recommended to take the 1" line and loop it to make sure there is sufficient pressure at the far end where 2 valves will be, but I think this might be overkill, considering its just drip irrigation (although there are some long lengths of run. The property is about 200ft wide by 120ft long. It would be a total run over over 300 feet to where we have the valves planned. Would I still have adequate pressure and all that? And after I figure that out, I can get to the valve questions. Do I need 8 valves? Is there a general rule of thumb for the size area that one valve can take care of? Zone does anyone have any suggestions for valves? Zone 1 and Zone 7 are on the outside of my 6ft redwood fence. The picture shows them covering a wider area than it actually will be. Its just going to be some shrubs and the existing large oak treek that are already there up agains the fence. But they are their own zones because they are on the other side of the fence and they run pretty long. (120ft+ for Zone 7 and a little less for Zone 1). 3. Does anyone have any recommendations for valves? 4. Can I put just one filter directly after the back flow? Or does every valve need one after it? I have seen that there are valves that have filters either connected to them, or built into the valve itself? Is this a good option? 5. Same as question 4 but in regards to a pressure reducer? Ive seen products that have a valve, filter, and reducer all preassembled in one piece. 7. Do I need to put every valve in its own valve box? Whats the best size and way to do this? especially if theres a reducer and filter attached to it. Thanks so much for all your help! I really look forward to your advice and please feel free to let me know if I'm doing anything crazy or stupid, need all the help I can get!